maybe one book, maybe three poems. Synopsis (from the publisher): It’s 1969, and the Apollo 11 mission is getting ready to go to the moon. But for half-black, half-Japanese Mimi, moving to a predominantly white Vermont town is enough to make her feel alien. Suddenly, Mimi’s appearance is all anyone notices. She struggles to fit in with her classmates, even as she fights for her right to stand out by entering science competitions and joining Shop Class instead of Home Ec. And even though teachers and neighbors balk at her mixed-race family and her refusals to conform, Mimi’s dreams of becoming an astronaut never fade—no matter how many times she’s told no. Why I recommend it: I used to shy away from novels in verse, until I read May B. by Caroline Starr Rose. Now I love them. 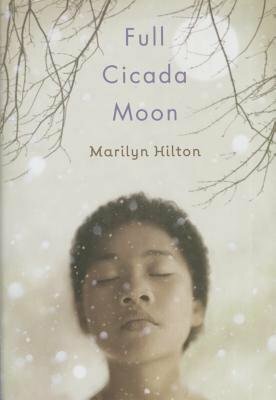 Full Cicada Moon moved me to tears. Happy ones. And that's saying something, because I rarely cry when I read MG. Mimi is one of the strongest girl characters you'll ever meet, and her story is one you'll remember long after you've closed the book and gone on with your life. The writing is spare and simple, yet gorgeous. If last year's Newbery winner wasn't a novel in verse, I would say this has a fighting chance of winning. Plus, the cover is downright stunning. There's been a lot of controversy in social media lately about whether or not authors should write from the POV of people from a different culture or race. In the author's note in the back of this book, Marilyn Hilton says, "I wrote Mimi's story in wonder and terror and awe, not knowing if I could or should write it." But she received much encouragement from her agent, her editor, and her friends, including Keiko Higuchi. I have to say, I'm glad Marilyn wrote this book (see the quote above by Nikki Giovanni, which says it better than I can). Reading Full Cicada Moon has made my life richer. This is one I will re-read. Bonus: This would be excellent for starting classroom discussions about tolerance. What do you think, readers? Do you freeze up at the idea of reading free verse novels? Or have you begun to thaw? Ah... May B. <3! This sounds like a sweet read, and I absolutely love the quoted material you've included here. Thanks for sharing this one! Isn't May B. wonderful, Sheri? You would enjoy Full Cicada Moon too. I also love the cover. I wouldn't even attempt to write in verse though I don't mind reading good ones. This sound like it does a fantastic job. Thanks for featuring. You're welcome, Greg. And you never know what you might be capable of if you try. Even a novel in verse. I do like verse novels and the quote you shared is perfectly beautiful. The cover just knocked me out! I will definitely be checking this one out. Thanks for this review. The cover is so gorgeous, I hope it will entice people to pick up the book! I do tend to shy away from verse novels, and I don't know why, because I love poetry, and I loved the only verse book I have read, Love That Dog. (It was short enough not to scare me, I guess!). I love the premise of this one, and you're right, the cover is gorgeous. You've convinced me I should give it a try! I had exactly the same experience--didn't like novels in verse til May B, now find myself actively watching for them! Have you read Inside Out and Back Again? Probably...I think it might have even been you that tipped me to it. If you haven't try it, too! As for this lovely looking novel, I think it's going to perfectly hit the spot! Thanks for the recommend! How wonderful for Caroline that so many of us came to love verse novels after reading May B. And no, I actually haven't read Inside Out and Back Again! I need to do that. I've read Thanhha Lai's second novel, Listen, Slowly, but it's not in verse. This sounds like a wonderful book. I love the cover. And I love the quote by Nikki Giovanni. Something I'm going to post on twitter and FB. Thanks for this share. I used to steer away from books in verse too until I read May B. This sounds like a really good one. Thanks. Another fan of May B who learned to love verse novels! You would love this one too, Natalie. Now you need to read this one AND May B, Jess! My goodness. Thank you, Joanne, for directing me here. I'm so grateful to know my girl has connected with so many readers in a personal way and has gently introduced a genre that might not otherwise be read. And I can't wait to read this beautiful, brave new book. As for the Nikki Giovanni quote, I'm stealing it, plain and simple!!! So glad you visited, Caroline! (Sorry, I've been AWOL myself.) And feel free to use the quote!